These 12 kindergarten subtraction videos help your children see subtraction in action! Block by block. Subtraction Practice Videos: The "Take Aways"
Be encouraged. Teaching Kindergarten subtraction is SO much easier than teaching addition and these videos can help with the practice. Also, using a video is great because, this way the flash cards do not get spilled and they always have the right equation with the right card. Kids memorize so much easier with videos. There is no music with these flash cards and they move at a quick speed. Your kids can pause and play if you want them to repeat the equations. See the helpful notes below each video. You'll be glad that I've closed up the off site links on this page, too. Enjoy! Once your students understand addition, subtraction is often a natural and will not need near so much drilling. Old Math textbooks actually taught addition and subtraction concepts together. As soon as the books taught the ones addition table, the next lesson was the ones subtraction table. Once you learn to add a number you can learn to subtract it easily if you see that there is an inverse relation. This was a giant surprise to me the first time I was teaching subtraction to little ones who were new to it. It became exciting! Once our students realize that it is an inverse relationship and that they are already familiar with the numbers, they are thrilled at how much less effort it takes to learn subtraction compared to addition. I am too. I marvel and now I am quick to show this fact, because they usually take heart that this is going to be much easier to learn. First things first. Make sure that your students understand the idea of counting and the idea of adding. All they're learning now is "undoing" the counting and adding, they do not have to know the complete addition table in order to learn to subtract. Really, subtracting by one is actually counting down. It's fun to teach a short song like 10 Bottles of Pop on the Wall. If you have the joy of one on one instruction, or are teaching subtraction in small groups, you have more freedom to see if your students can learn the facts along with learning the addition facts. Otherwise, as a set, the subtraction tables are usually easier to learn than the addition facts simply because children already have experience using the very same numbers and they know how to use the terms in an equation. 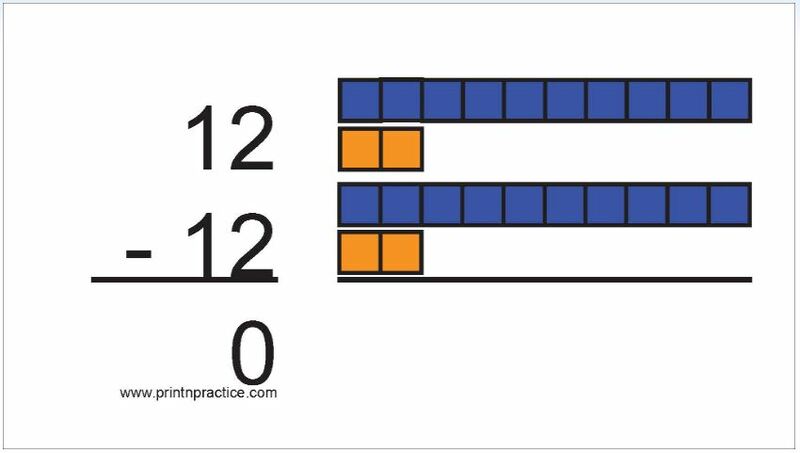 Our subtraction worksheets together with our flash cards help your students learn the Math facts in an organized way. When I'm teaching subtraction problems all by themselves, not mixed with addition, I treasure starting with the problems in order first. The equations make more sense that way. If you use our Kindergarten subtraction worksheets, your students can practice the subtraction problems with the correct answers printed above the space so they can copy the equations three times. You can rest while your students work - rest confident that they start with the right equation and the right answer. All you have to do is check that all three answers are the same - we all know what can happen by the third line! I so recommend that you use practice as a way to make the children learn more quickly. Every minute spent repeating the correct equation and answer saves time and heartache later. Keep the exercises short and keep your voice happy so that it is painless for all. Repetition is key. Whenever mine ask me the answer I tell them and have them quickly repeat the equation and the answer three times. My favorite way to use the flash cards is to start by teaching subtraction with the answers forward. Then I say the equation and ask the kids to repeat it three times. There's less coaching as they learn more tables, so be patient in the beginning. The better foundation you lay at the beginning, the easier the rest of the school year will be. I am also very happy to have had math manipulatives to show the concepts and how subtraction is related to addition, and then I move to memorizing the facts. Most of my kids learned their math facts well simply repeating the equations with their answers three times each. We used subtraction worksheets on which they copied the same equations three times each, too. Together this reinforced their knowledge of the answers. It's fun to see the children handy and happy knowing their math facts! Mixing up the way to practice the equation helps them remember better which is why it is so nice to have our different kinds of subtraction worksheets and flash cards for practice. 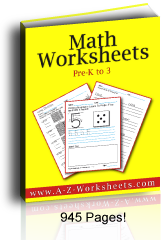 Some can be used for kindergarten subtraction worksheets and they're excellent review for first grade subtraction and later years. Scroll down to see our other videos below. Bookmark This Page by hitting Ctrl+D or Command+D on your keyboard. I find that when the children know addition, they can zoom through subtraction if they see the connection. Show that not only are 2 + 4 equal to 6, but also 6 - 4 are 2. Counting down by twos is an activity that helps show subtraction, too. Use different terms, too, especially if you can use pennies or blocks. There are different ways to word subtraction problems. Three take away two is one. Four less two are two. Five minus two are three. When the equations are combined your children can make the association fast. Once many students practice our these addition and subtraction worksheets once, they frequently know their subtraction facts, especially if they know their addition facts well. This is a super review for children in higher grades. See our 2 in 1 addition and subtraction worksheets on either our addition or subtraction pages. Learning to subtract three can be more complicated concept wise. Sliding three pennies away, though, is still an easy way to show the concept. By the time children begin the fours table, they're starting to get the hang of it or they dread the new work. If the dread is simply that they do not understand the ones, twos, and threes yet, encourage them to practice those, too; but I really think that they'll catch on better if you don't linger too long. They can always grab a worksheet to practice the old table, but waiting to know the old table perfectly can be counterproductive. There's something about the fives that is fun, no matter the operation. Five is a handful. Two hands full are ten. Take away five and you're back to five. If your child understands some of the money terms, you can practice with nickles. Nickles make it easy to "take away" five in one move. Teaching subtraction gets a little tougher through the sixes, sevens, and eights. Memorizing the first ten or twelve facts can make learning subtraction facts easier and increase retention and use-success-rates throughout the years. Allow time to review the facts in order first. Practice makes the memorizing easy. Some students do not pick this up quickly, so extra practice making the associations is a big help. Putting the flash cards in order for several review sessions or using our subtraction practice videos (above) can be a giant help. Simply show the equations from a chart and review the videos that never show the wrong equation. The interaction of Kindergarten subtraction practice, often makes all the difference for subtraction being easy in the future. Also, if you are using all 12 tables the last few are easier since the facts have been studied in the earlier facts and have the same endings, as with 6 + 1 = 7 and 6 + 11 = 17, etc. Again, memorization makes the sevens easy to learn. By the time they're learning the eights, they already know more than half the subtraction equations, because they've already learned 1 + 8, 2 + 8, 3 +8, etc. in the lower tables. God bless ten! It's so easy to use. It's so easy to subtract, too. Teaching the tens can be the beginning of teaching two column addition and subtraction. Memorization makes it handy, yet you can still teach the mechanics of the second column. Sometimes when your kids understand the system, it helps your kids in memorize. Subtracting eleven can be fun, but it can also be perplexing. Either simply teach them to memorize from rote or teach the concept of subtracting from two columns. Let the videos do the rest. If there is no confusion, 11 - 1 = 1 is fun to see. It's also fun to write. By the time most children are learning the math facts for subtracting twelve, they've gotten a pretty good idea of the energy necessary to memorize the next twelve equations and they even anticipate the similarity with the addition tables and the table for subtracting 2. The 10s, 11s, and 12s are so much easier to learn since they are so similar to the 0s, 1s, and 2s. Your kids will speed through the math facts while learning the twelves if they remember the associations. Why learn subtraction beyond 10? Well, it's super handy sometimes to be able to count by 12 so as to figure dozens. Even if this is above Kindergarten subtraction level, many children get the idea when simply talking about dozens of eggs. Additional to our subtraction videos, I think you'll really like our 2 in 1 addition to subtraction practice worksheets and reference sheets that make the association between addition and subtraction easier to practice, yet these might also be too high a level for kindergarten and first grade. They make a super review, especially for older children since they cover more facts with less work. Go to our main Kindergarten subtraction worksheets page for oodles of subtraction choices. Thank you for visiting our Subtraction Videos.